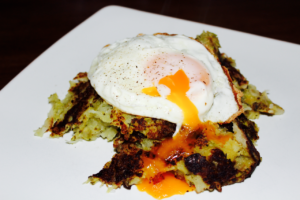 If you’re looking for a way to use up those bits of left-over veg from Sunday dinner or just need to clear some space in your fridge, Bubble and Squeak is a tasty, quick and very old-school fix! No recipe really needed here, simply mash up your cooked left-over veg or chop and boil/steam your uncooked veg until soft. 15-20 minutes should do it, then mash it coarsley. Try anything such as broccoli, cabbage, sprouts, carrots, peas and onions. I’ve also used some boiled potatoes for a bit of extra hearty-ness. Add a knob of butter and a drizzle of olive oil to a hot, large non-stick frying pan and then add the mashed up veg with some sea salt and black pepper. Fry until crisp and golden brown on one side, then do the other side – don’t worry if it all breaks up, this is a good thing! Meanwhile, fry an egg in a separate frying pan and once the Bubble & Squeak is browned and crispy on the outside and hot all the way through, serve it out, bosh the egg on top and tuck in. I find a dollop of brown sauce never goes amiss either! Lovely. Click here for more recipes from The Food Beaver. This was absolutely delicious!!! Thank you.